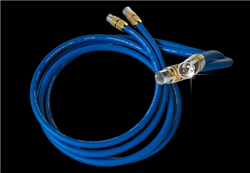 Clear Beyond Interconnect builds on over 30 years of Cardas Audio's relentless dedication to the perfection of high performance cables. Superior shielding and advanced air-tube suspension geometry result in an O.D. of .511"�, which necessitates the use of our XRCA 13 adaptor for single-ended termination, and a re-designed CG XLR for balanced cables.